Simply beautiful! Even better that it's made from scraps - well done! I'm with you here Vicky, this type of crafting is so satisfying. You must check out that Crochet book, I promise you you'll (excuse the pun)be hooked! Have a fab weekend Vicky! So sweet Vicky. I love the way these colors pop against the kraft. 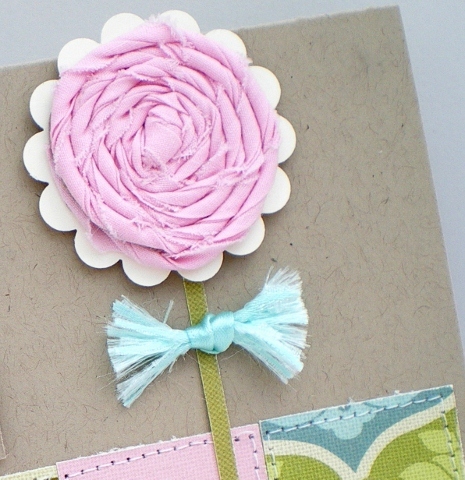 So glad you could join us on Card Patterns this week! Hope you managed to get all your DT work done. Have a great weekend, Vicky. Fabulous card Vicky. It really is very satisfying when you can use up gorgeous scraps and not let them got to waste! This is just fantastic, Vicky - I love everything about it. 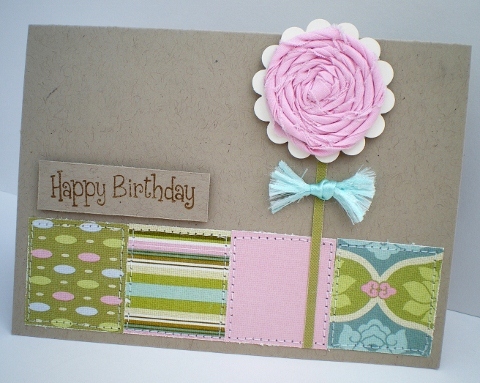 How come when I use Kraft my cards look drab, whilst yours look fab? Fabulous and so satisfying when your work is made from scraps, hey? Fantastic bias binding flower. Absolutely beautiful!!! I love your flower and the colors are soooo sweet! Thanks for joining in the fun at Card Patterns this week!!! A gorgeous card Vicky, I love the flower!